Today is the birthday of Amerigo Vespucci (1454-1512), an Italian navigator who explored the newly-discovered Americas, got his name attached to them, and arguably deserves his own holiday more than that other Italian navigator you might be thinking of. Columbus Day has become highly controversial in recent years among the Native American community and others, and beyond his personal flaws (which are many), people argue that you can’t really discover a place where people already live. Now, as for the second point, the fact that the Europeans didn’t know there was a continent here in 1491 and this event being such an important part of world history, means it’s perfectly plausible to have a holiday for it if you want. But I agree that Columbus himself does not deserve it. Columbus wasn’t exactly a genocidal monster (if there was ever any plausible way to prevent smallpox from wiping out most of the Americas, I don’t see it), but he was most definitely a jerk. And more to the point, he certainly was not the paragon of perseverance in the face of ridicule that he’s been made out to be. Some people suggest Leif Erikson Day (October 9) should replace Columbus Day. And while it’s true that Leif Erikson was the first (confirmed) European to reach America, the fact that the rest of Europe forgot all about it suggests that maybe he wasn’t notable enough to serve the role. Amerigo Vespucci, however, presents a good case. He made four voyages to the Americas between 1497 and 1504, and he actually knew what he was doing. 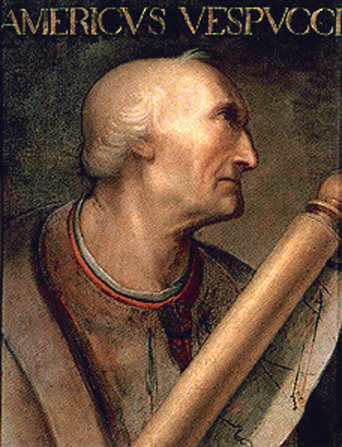 Vespucci was the first explorer to prove that the Americas were not East Asia, as Columbus said. Meanwhile Columbus insisted till the day he died, in the face of mounting evidence, that he’d discovered a new route to Asia. Vespucci was also the man who coined the phrase “the New World” (“Mundus Novus”) in a letter to Lorenzo de’ Medici in 1504. As a result when German cartographer Martin Waldseemüller created a new world map in 1507, he didn’t name it Columbia after Columbus; he named it America after Amerigo. Just as a disclaimer, there is definitely dispute about the veracity of Vespucci’s exploits. However, at least one of his voyages, the third, is considered unassailable, and the America name dates from within his lifetime, so it’s a valid point. Besides, people think Columbus was the Only Sane Man who believed the world was round when in fact he was the clueless one*, so I’m not too worried about honest uncertainty here. So happy Amerigo Vespucci Day to all! * People knew the Earth was round and how large it was since Eratosthenes first measured it in 240 BC. Columbus believed due to various errors that it was about 25% smaller, and that what would have been an impossibly long voyage to Asia would have been plausible. Washington Irving invented the “flat Earth” myth around Columbus from whole cloth in his “biography” of the man in 1828. This entry was posted in Culture, History and tagged Amerigo Vespucci, Amerigo Vespucci day, Christopher Columbus, exploration, Leif Erikson. Bookmark the permalink.